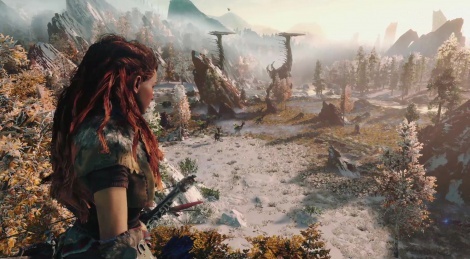 Horizon Zero Dawn is a PS4 exclusive RPG slated for release sometime in 2016. It is probably safe to assume that this will be in the Autumn period. To sum it up, the game is set in a post-apocalyptic world where Native American style tribes hunt giant robot dinosaurs. The game’s protagonist is a young woman named Aloy, (haha, get it? Aloy? Alloy as in the metal. Haha…), as she hunts the robotsaurs for their metal innards in order to survive. I don’t know any details of the narrative but we see that the great cities of the past have been deserted and overgrown while humanity has been reduced to hunter-gather tribes. The trailer speaks of a robot uprising that destroyed civilisation so there is plenty of history and back-story to be played with. 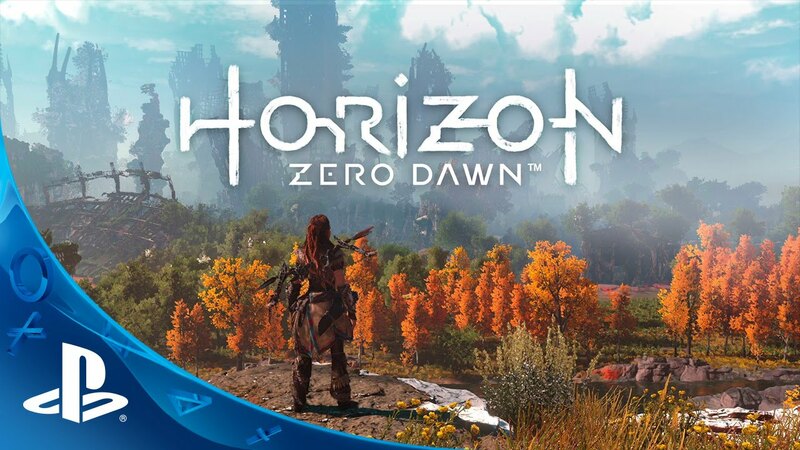 The developer of HZD is Guerrilla Games, best known for the Killzone series. This is their first attempt at an RPG game but they do have some pedigree when it comes to making games. On to the specifics. The world of Horizon Zero Dawn looks beautiful. As we know, graphical quality in games can change from promotional footage to release but from what we are shown it is a vibrant world with a good draw distance. The dense forests, Native American vibe and Assassin’s Creed free-running puts me in the mind of Assassin’s Creed 3, only hopefully HZD will be a little better in its execution. Gameplay wise, HZD has been described as a mix between Assassin’s Creed and The Elder Scrolls V: Skyrim. As I said before, the general movements do look fast paced and fluid like in Creed games and we have also seen stealth mechanics of creeping through tall grass almost exactly like said games. As for the Skyrim comparison, I have yet to see anything that really resembles it. The combat looks smoother and more intense than Elder Scrolls combat, relying on timing, dodging and striking vital points on the enemies. Hunting appears to be a core mechanic so presumably upgrades and equipment will be fuelled by parts from fallen mechanical creatures kind of like in Far Cry. Let’s look at our character too. Aloy is a red haired female hunter who uses a bow as her main weapon. We know little else about her at the moment other than she hunts to sustain her tribe. I can’t judge her as a character yet as we have only really seen her in action. You know what is sad though? Go onto any Youtube video about the game and there is a substantial number of comments complaining that you are forced to play as a female character. Is this really where we are as an industry? It’s ironic really. Women in games only became a problem when people started to say that there were not enough women in games. We’ve always had them, maybe not great examples of women, but they’ve been there. I don’t remember people complaining about playing as a women in Tomb Raider, Beyond Good and Evil, Metroid, etc yet now any female character is automatically pandering to feminists. *Sigh*. Look at it this way, game narratives are stronger when there is a set character. The story can be tailored to a character and hence becomes more focussed. The Witcher series would not nearly be as good narratively if we played as a no named character who could be good or evil rather than the developed character of Geralt. We have lots of RPG type games with set protagonists so the problem for these people is clearly only that Aloy is female. This is stupid. It is all so hypercritical. Whenever people complain about male protagonist such as in Assassin’s Creed, folk come to its defence saying that that is the story the developers want to tell but when it’s the other way around it suddenly becomes bowing down to social justice warriors. A character should be judged on, well, their character and not what rests between their virtual legs. There are some really badass female characters out their who appeal to both sexes and nobody should be angry about trying to make some more. But enough about that. This is a look forward at a game and not a rant. From what I have seen so far, Horizon Zero Dawn looks like a solid and aesthetically stunning game with an interesting setting and fun mechanics. So far I see it as Tomb Raider meets an open world environment meets mechanical mega dinosaurs with rocket launchers. That sounds pretty damn cool to me. I predict that it will potentially be the biggest selling PS4 exclusive after the new Uncharted game. Fingers crossed that it lives up to my expectations.